When weeknights leave you little free time, it's tough to muster up the energy to pull together a full meal. The other struggle is feeling uninspired by your boring old Rolodex of recipes. These are two conundrums we fully understand, but the benefits of a home-cooked meal are tough to beat. For one, you can take control of your health by putting only the best ingredients into your body. Secondly, cooking can be quite a therapeutic process and a great way to unwind at the end of a long day. It's best accompanied by a glass of wine and a moody playlist if we do say so ourselves. To inspire you to get back into the kitchen, we've compiled a few of our favorite easy and insanely delicious recipes that can be whipped up quickly on a hectic weeknight. Even if you're busy, you'll be able to cook up these creative concoctions—we're talking roasted zucchini burgers and stuffed sweet potatoes—without much effort at all. Keep reading for seven simple, flavorful recipes that can be enjoyed any night of the week. We have to thank Half Baked Harvest for this heirloom tomato cheddar tart, which combines all of our favorite ingredients (heirloom tomatoes, basil pesto, Cheddar cheese, and puff pastry) into one amazing gourmet version of a pizza. The best part? It only takes 35 minutes to whip up. This recipe from The First Mess takes your standard sweet potato to a whole new level. Loaded with spiced chickpeas and drizzled with a tangy, sweet tahini sauce, each bite is better than the last. With a prep time of only 10 minutes, these easy-to-make sesame chicken thighs from I Am a Food Blog come out of the oven full of flavor and make for a satisfying meal all by themselves. We all love a good Caesar salad, but throw a little pasta into the mix and it becomes a recipe for the ages. This satiating pasta salad from Foodie Crush only requires five ingredients and takes less than a half-hour to pull together, which is why we make it at least once a week. 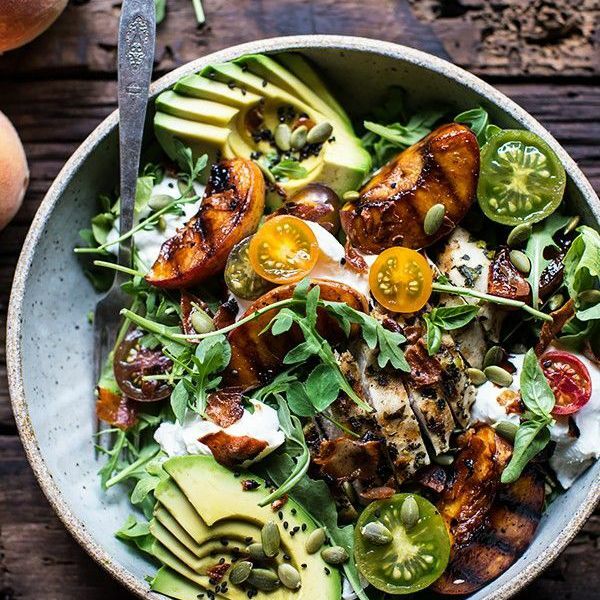 This balsamic peach basil chicken salad recipe from Half Baked Harvest is the perfect combination of savory and sweet, and it's extremely easy to throw together last-minute. Did we mention it's packed with nutrients, too? We'll leave it to Goop's food editor, Thea Baumann, to summarize the beauty of this olive oil-poached halibut with squash ragu dish from the site: "During the week, I stick to recipes that are either super simple or can be mostly made in advance, like this olive oil poached halibut dish. It's fancy enough for a dinner party, but since most components can be prepped a day or two ahead of time, is still totally manageable on a weeknight." Swap your standard burger with this delicious zucchini burger recipe for a fun and healthy alternative on a weeknight. The roasted zucchini cakes topped with a whipped garlic feta sauce couldn't make for a better combo of flavors. What's your go-to weeknight recipe? Let us know, and shop a few of our favorite pretty kitchen accessories that will inspire you to cook below.